It was SOOOO nice yesterday. Check this out..
Wooohoooo....And mom opened the windows and the screen door!! Nothing too exciting. Mom did laundry and hung out with us. Oh - and there is new squeaking from the bathroom. That is right ladies and gentlemen - we are back in the baby business. This is for the same group that rescue Chiclet and her kittens. The babies were born 3/29/11. Their eyes are mostly open and we have 3 girls and 2 boys. And one of the boys is a polydactyl (mitten paw) - the first we have ever had here. But mom was a little sad....someone had front declawed Leia. Which means a vet did that but didn't spay her. We just don't understand how a vet could do that....and then her family either lost her or kicked her out. If the nice couple hadn't found her and taken her in, we think there is no way this family would have survived. The couple that found her gave us a donation and stuff to help out. They just aren't "cat people" plus the dog in the house was barked constantly at the door. They did everything right (tested her, vaccinated) and just needed some help. They even said if Leia can't be placed, they might be able to take her back. We hope Leia finds a more appropriate forever home, down the road (we mean one without a constantly barking dog to possibly upset her). We hope the babies are all healthy and doing well and find terrific forever homes too! A hope Leia finds a forever home without the barking dog! I don't understand a vet who declaws and doesn't spay/neuter the cat. I mean, declawing is bad enough but to have a cat under anesthesia and not spay/neuter? That's an idiot that shouldn't have a license. Darling sweetest Leia. She and her kittens just went straight too my heart. That's horrible! What kind of vet would do such a thing?! I totally agree with Kim and Alley Cats and Angels. We are purring and praying for Leia to find a forever home real soon. Oh sweet Leia. Oh me and Charlie are so sad you were de-clawed. You poor sweet wonderful kitty. And to not spay you.. bad vet!! Bad, bad, bad!!! We are only so glad that you and your beautiful babies are safe now. We hope you all find good loving and wonderful homes!! 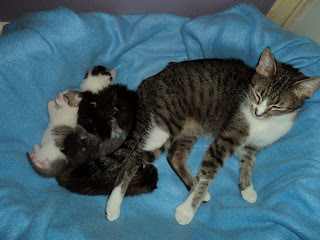 Thank you so much for fostering Leia and her babies. I find it reprehensible that a vet would declaw her without also spaying her. We are so upset that Vet did that to you and that someone paid him/her to do that. IT should be illegal. We are glad you are now safe and that you will find your forever home as will your babies. YOU are safe sweet girl. What a lovely mummy she is. It is so nice that the windows can be opened again :) Yay Spring!!!!!!!!! We are glad the couple offered some help for Leia and her family.Declawing a kitty is horrid,we agree!! Hi Leia! Very nice to meet you! We just popped over from Connie's where we saw your foster mom had commented. You have a lovely family and we'll purr for all of you to find the best of furever homes. We're quite puzzled and sad, too. I'd like to think the best, that Leia got inadvertently separated from a loving home, but it's hard to see that here. If Leia "escaped" between surgeries, you'd think the vet would have done the ladygardenectomy before declawing. I don't like declawing at all, but I know some vets (who don't like it either) will perform the procedure if it makes the difference between a cat being given up and keeping its home. We hope Leia and her tiny babies find loving safe forever homes that understand the true needs of these wonderful ones. Glad the weather is now warm enough to whiff the fresh air. You are all amazing to do so much for kitties in need.